The holidays are now in full swing around here and on InStyle.com. InStyle's Holiday Boutique is a limited time, exclusive pop-up gift shop that is now open and chuck full of goodies for the fashionable gals in your life. From the most perfect faux fur vest to an incredibly festive sequin skirt, you will find that InStyle's Holiday Boutique has everything you need with 30+ fashion-forward brands being featured. So don't miss out on this one because the Boutique is only open for a limited time - 11/11/13-12/27/13. 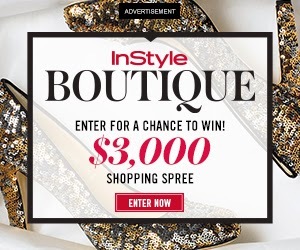 Oh, and while you're there shopping for this season's must-have holiday items (or just building up your wish lists and gift-guides) you should also enter the InStyle Boutique Sweepstakes for a chance to win a $3,000 shopping spree! It's easy peasy and who doesn't want to win a $3,000 shopping spree?! You can follow InStyle on Twitter and Facebook for more information about the Boutique and to check out all the latest fashion trends. Happy holiday shopping, friends! This post was sponsored by InStyle but all opinions expressed herein are my own. Thanks for supporting the brands that make Fashion Truffles possible! The cream sweater looks so soft and cosy. Just what we need here in the chilly UK! that fur vest seems like the ultimate cozy piece!! I love the color of it as well! Online shopping of dress is a nice way to get more options and designs.I like this very much.One can get different designer dresses through online.So if you want to do online boutique shopping then have touch on it.